Ingredients that blend together to perfectly compliment every dish, every meal, every breath-taking view. 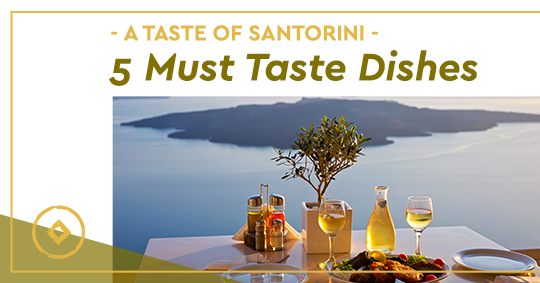 Let’s discover the most delicious dishes of this incredible volcanic island of the Cyclades, Santorini Island. 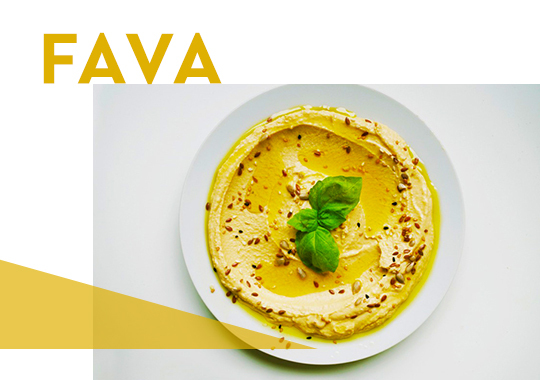 Made of yellow split peas that can be found in abundance in Santorini, this authentic creamy delicacy is a signature dish of the island. 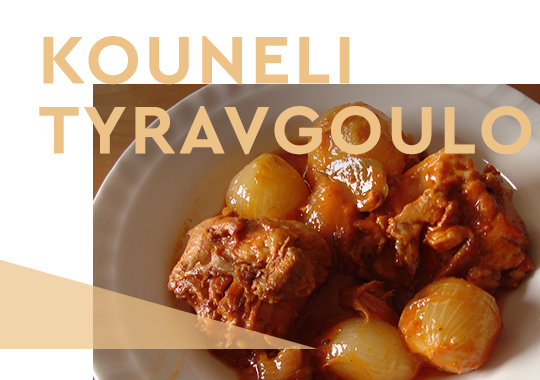 It is usually served with warm olive oil, chopped onions, capers and then…drizzled with lemon. 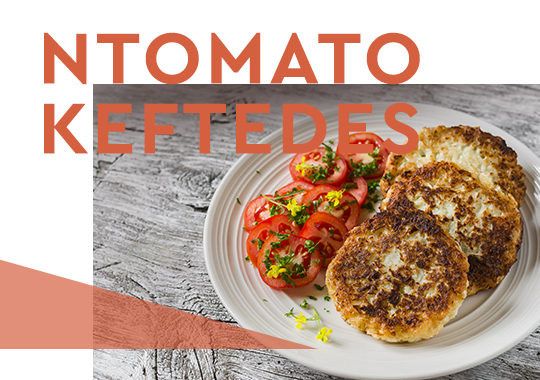 Prepared with local cherry tomatoes, Santorini’s tomato fritters are a must try dish even for vegetarians as it only contains vegetables and herbs such as peppers, onions and mint. The mixture is separated in small size fritters, dipped in thick batter and fried in olive oil. Another delicious recipe inspired by the island of Santorini is the cheese-egg rabbit. Small pieces of rabbit are fried in olive oil with onions, garlic and flour and then braised with wine, bay leaves, salt and water. When cooked to a great extend beaten eggs, grated cheese and wine are also added to complete the recipe. 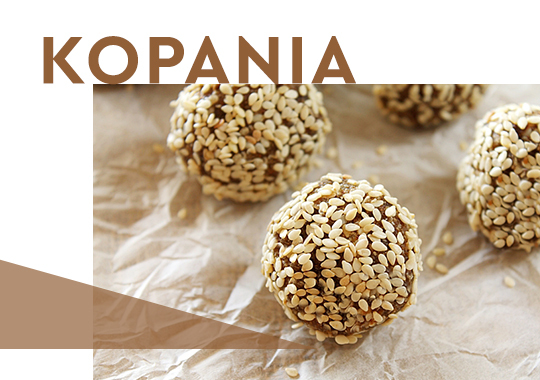 Regarded as one of the most authentic Santorinian sweets, the Kopania bites are made of crushed barley rusks, mixed with raisins and sesame seeds. The mixture is rolled into little balls and drizzled with more roasted sesame seeds. There are many variations of Kopania such as the one also containing wine and coconut. 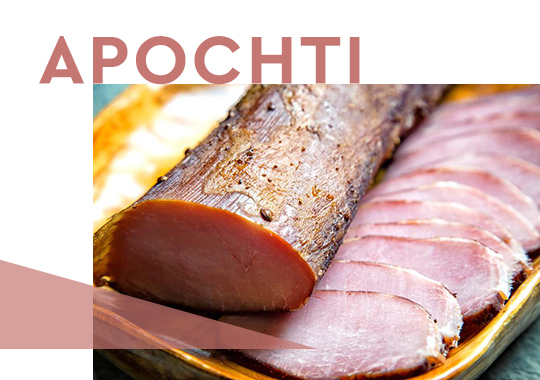 Apochti is a type of salted pork loin that is first salted, then placed in vinegar and then air-dried. Later on, the meat is sprinkled with pepper and cinnamon and stored to rest for six hours. After the six hours have passed the meat appears harder and only then you know that it is ready to be served or used in all kinds of recipes. Beginning with the famous Santorinian cherry tomato, the island’s culinary treasures never cease to amaze. Make sure to also try the unique white eggplant in a variety of recipes, the cholorotyri cheese that can also be used as a spread, the delicious capers and of course the world renowned Santorinian wines such as Assyrtiko, Nyxtheri, Athiri and Aidani at some of the island’s top wineries. Tasty right? Well sit back as our culinary journey will continue with more culinary destinations. Get ready to follow the scents and aromas of Santorini’s mouthwatering recipes to the land and gastronomic specialties of Milos. So, till next time… bon appétit! This entry was posted in Cycladia Posts, Destinations, Gastronomy, Santorini, Tourism Insight and tagged gastronomy, santorini island. Bookmark the permalink.